Mata ni Pachedi literally means “behind the mother goddess”, and is a cloth that constitutes a temple of the goddess. It is a art form from Gujrat. The pachedis are essentially an expression of the divine cosmic energy of the mother goddess and the unified manifestation of the creative and the destructive principles in her person. Pachedi is used as a canopy that forms a shrine, or is spread over altars or worn by the shaman while worshipping or in a trance. When people of the nomadic Vaghari community of Gujarat were barred from entering temples, they made their own shrines with depictions of the Mother Goddess on cloth. This ingenuous solution is believed to be the origin of Mata ni Pachedi, the sacred art, which is now revered by all. Traditionally the Mata-Ni-Pachedi was painted on walls of temples (Mudh of Mata’s). The pachedi have a distinct visual identity that is developed through the use of strong bold forms and re-enforced by the application of stark colours-blood red, black and white. The central feature of the shrine cloth is invariably the commanding presence of the mother goddess; the goddess is believed to have a hundred forms and is consequently depicted in each of these along with the appropriate iconographic details and attributes. The main characteristic feature of the Pachedi was that in center part there was a figure of Mother goddess and in right and left part other motifs like mythological characters, human figures, musicians, sacrificial animals and flowers were placed. It was always highlighted with bold ornate borders. Traditionally Pachedi always framed with the ornate border in black and red with white as surface colour. Each colour has its own significance e.g. black colour indicates the evil eye, red indicates the colour of earth mother as well as blood which is sacred feature during worshipping mother goddess and white indicate purity. 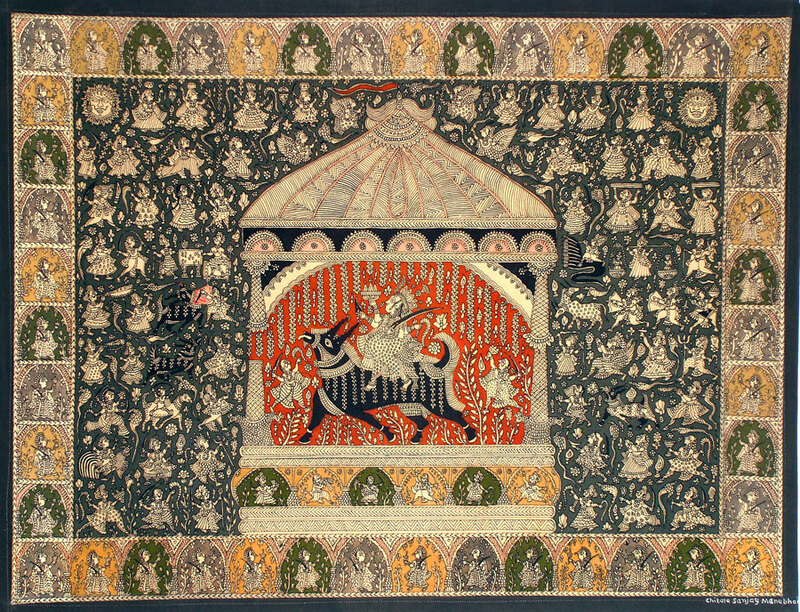 Mata-Ni-Pachedi was made only with two naturally obtained colours, black (jaggery, iron rust and water) and red (alum, alizarin and dhawadi flowers) on white background. To quicken the process and meet demands of villagers, who would commission paintings to offer to the mother goddess on fulfillment of wishes, the painters started using mud blocks for printing. These blocks were large and coarse, and after using a few times, would be thrown in the river where they returned to the soil. Over the course of time, wooden blocks replaced mud blocks, facilitating the use of finer motifs. Yet, the craftsmen still often make the entire painting with the bamboo “kalam”, using blocks only for printing the borders. It takes days of patience and dedication, to prepare one piece of this beautiful folk art. For instance, painting a cloth of 5” x 9” can take two months. The artists get a rush of orders a couple of months before the Navaratri festival. One Pachedi of 4 metre called Chauryashi Khatu , includes 101 motifs of the goddess of different castes and supplementary motifs. While craftsmen are refining this folk craft to suit the changing times, yet the sanctity of this religious artifact remains untouched. Creating Pachedis as well as new illustrations that are relevant in today’s context, but in the same folk style, these craftsmen have remained true to the cause of spreading the glory of the Mother Goddess and her wonderful art.